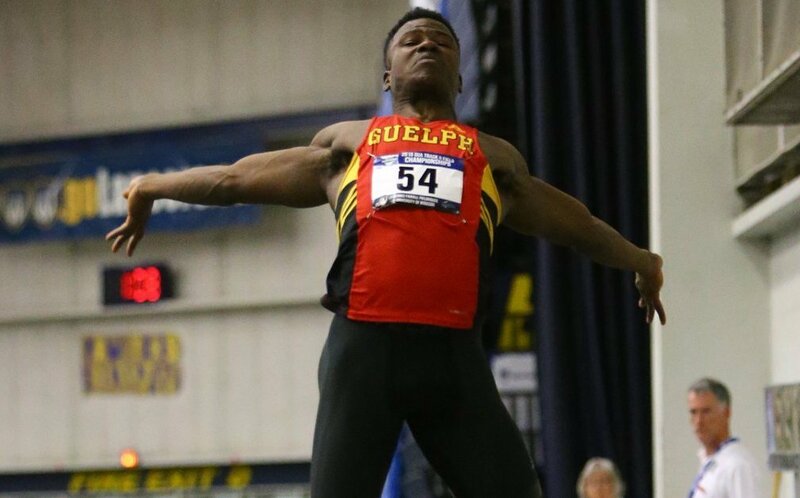 The Guelph Gryphons men will be looking to defend their national championship and capture consecutive titles at the 2018 U SPORTS Track and Field Championships this weekend while on the women’s side, the Toronto Varsity Blues will be competing for their fourth consecutive championship. Heading into the national championships, both the men’s and women’s programs at Guelph are ranked first in the country. 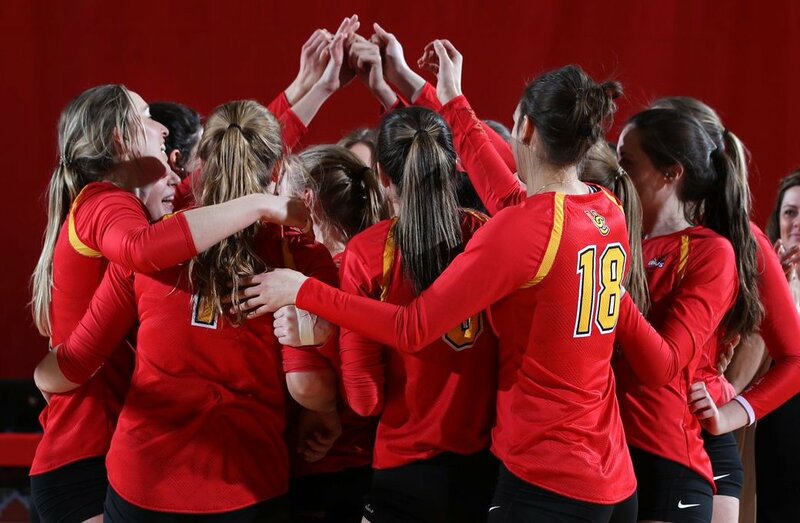 The Gryphon men have held onto the number one spot all season, while the women had a single week where they dropped to No.2 behind Toronto, before returning to the top spot. The Varsity Blues women have won the past three national championships, but will have a tough time beating the Gryphons to win a fourth consecutive banner. On the men’s side, Guelph is the favourite to win their second straight title. A championship schedule and conference by conference previews are available below. The Alberta Golden Bears claimed their seventh CW men’s track and field championship, beating out host Manitoba for first place. Alberta’s Austin Cole was named a track Outstanding Performer for winning gold in the 300m, as well as the 4x200m and 4x400m relays. Tyler Smith of Victoria took home three gold medals and a bronze (600m, 1000m and 4x800 relay team; bronze in 4x400 relay team). In the field, Golden Bear Spencer Allen set a new CW pole vault record, clearing 5.31m in his gold medal performance. For the women’s competition, the Saskatchewan Huskies beat defending champions Alberta to capture their 19th women’s conference title, a CW record. 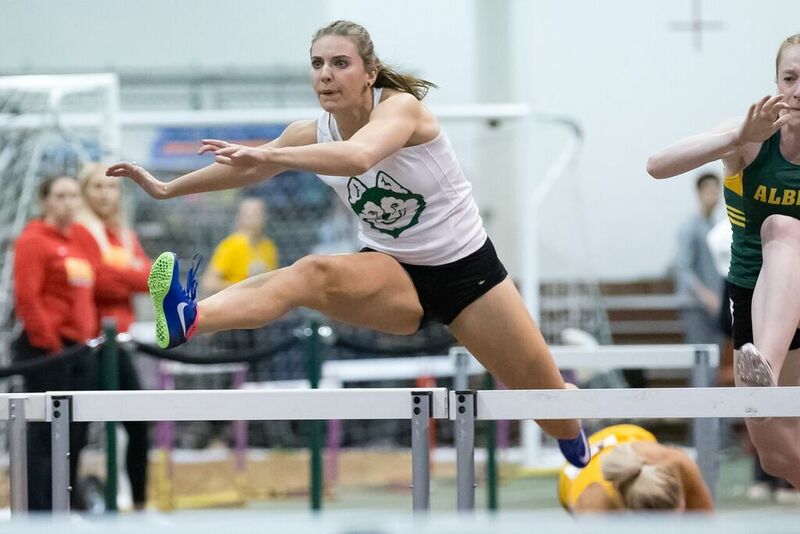 Huskie Julianne Labach had a meet to remember, winning four medals (gold in 600m and 1000m; silver 1500m and 4x400m relay team), earning recognition as a track Outstanding Performer and winning CW Athlete of the Week honours. Victoria’s Regan Yee established herself as the mid-distance champion with gold medals in the 1500m and 3000m races, and a silver in the 1000m. In the field, Saskatchewan’s Olena Olenick won a gold and silver in the weight throw and shot put, respectively. The OUA conference title was the Gryphon men’s second straight title and fourth overall, all of which have been won in the past six years. 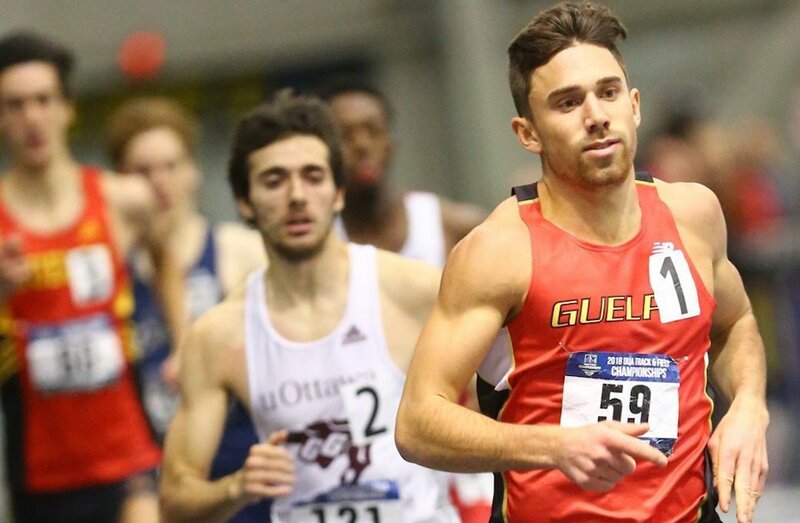 Guelph’s Thomas Land won two gold medals, finishing first in the 600m and 1000m races. Western’s Jack Sheffar also collected two gold medals, winning the 1500m and 3000m. York’s Nicolas Fyffe leaped his way to a gold medal in the triple jump and a bronze in the long jump, while Guelph’s Mark Emode could not be matched as he won the heptathlon by nearly 500 points. 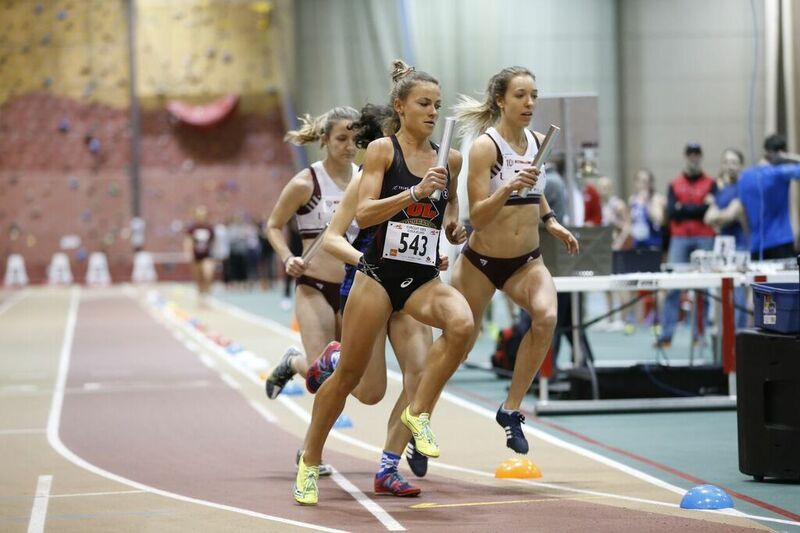 Guelph’s women ran, jumped, and threw their way to a third consecutive OUA title and sixth overall. The Gryphon were propelled to victory by Shyvonne Roxborough (gold in the 60m and 4x200m) as well as a one-two finish in the high jump, with Maja Naruszewic and Arabella Alton each clearing 1.71m. Windsor’s Kelsey Balkwill, who overcame a series of serious injuries earlier in her track career, won the 600m by more than half a second. The Rouge et Or women's track and field team won its first RSEQ title since 2014 thanks to a score of 230 points, 43 more than Sherbrooke's Vert & Or. As was the case with the men’s squad, Laval’s women scored points in every event, proving the depth of the team. The medal hopes are based on Jessy Lacourse (gold, 1000m, 1500m, 3000m), Aurélie Dubé-Lavoie (silver, 1500m and 3000m), Noémie Jeffrey (gold, weight throw and hammer throw) and the 4x800m relay team (gold). 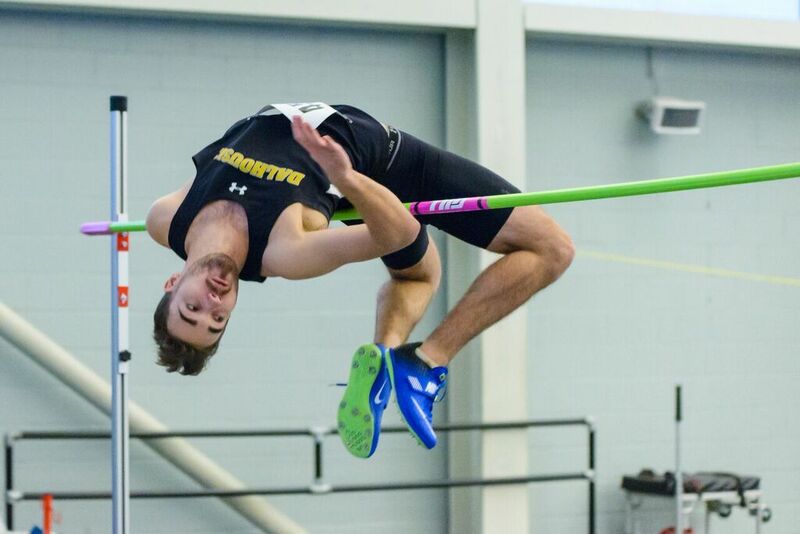 The Dalhousie Tigers claimed both the men's and women's championship banners at the 2018 Subway AUS Track and Field Championships hosted by the Université de Moncton. The Tigers women’s team won their 29th straight AUS conference title. Dalhousie’s Michelle Reddy was named the female athlete of the meet after collecting gold medals in the 600m, 1000m, and 1500m races. In the field, Moncton’s Constance Gilman showed her strength with a gold in the shot put and silver in the weight throw. Meanwhile, the men’s team captured its 16th title in 17 seasons, with Audley Cummings being named the male athlete of the meet for winning the gold medal in the long jump and heptathlon. He also just missed the podium in the pole vault with a fourth-place finish. Fellow Tiger Kaelan Schmidt also excelled in the field events with gold medals in high jump and triple jump, along with a silver in the long jump. Full meet schedule available at here.